Read everything in this Free North Carolina posting of this M4Carbine.net comment. Note the title change between this post and the originals, as this editor believes most who can and will defend either don't have a hidey-hole or won't be able to get there. Finally, don't get so fixated on repelling boarders that you forget or underweight the "fighting retreat to the alternate" option. Looks like a French house. 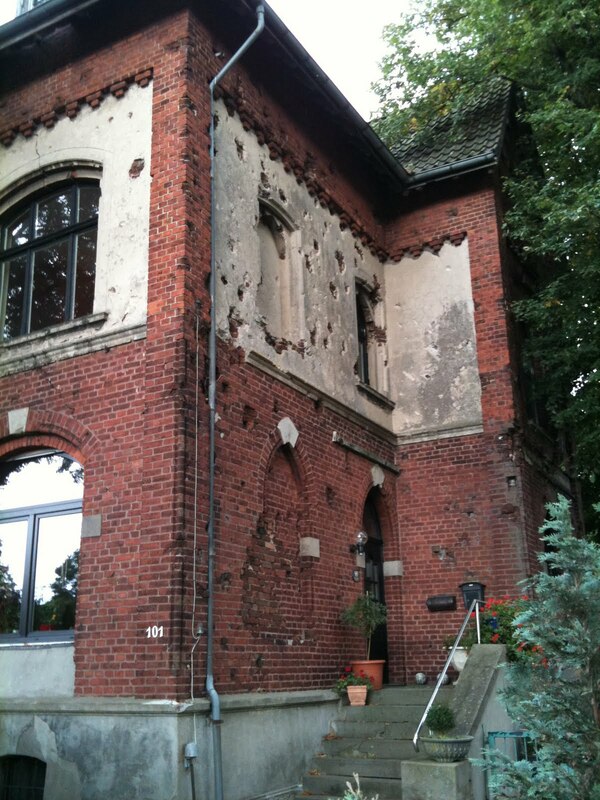 To this day you can see where the Germans had MG's set up, from the bullet holes left from taking them out. The French have never heard of paint and plaster either. And back to the comments. To hole up in one's house and hope to survive an attack, well, unless any of us live in a prison or old fort, the chances are slim. I watch people put 3 padlocks on a door and they can't understand when I tell them I can get thru almost any wall in a minute with a chainsaw and carbide chain. No matter how well you think you prepared, someone will find a way in, or gas or burn you out. Short of building a firebase with bunkers and 100 men, none of us can prepare for EVERY worst case scenario. You might win today, but tomorrow the next group will dig you out. Actually, West German - but it's the same concept. 'Holing up' means you are going to die, according to the smart folks from whom I have learned. "Holing up means you are going to die"
Allowing yourself to be fixed is usually fatal. Then, the options were to either stand and fight an infantry company (and die) or drive off as fast as we could and be blown to pieces by Hellfires from the OH-58s (and die). I agree with 0321. Have a way out. If we're reduced to defending individual households in this country, then we've already lost. Bottom line is, it means they were better organized and focused while we were divided and ready for conquering. Heh. The Cooper article assumes that the cops are the good guys! In any active defense, train and prepare to go on the offensive,ie,sally immediately after contact. The sooner, the better. You can't figure things and always come out 100%, but this will raise your chances higher. You must never get the bunker mentality. Keep things so that you either see or hear, or even smell them coming, and come out and take the fight to them, quick. Good prep is to also put things in their paths beforehand that will slow down, harrass, or kill them. They may and probably will suprise you, no matter how well you do prep. Have surprises for them. And if you do discourage them and they go away, go after them and kill them all. That's what they will eventually do, if you let them go. Let all and sundry neighbors know that too. And have a secret way of bugging out, so you can escape if that is all you have left. Never, ever, give up. Its a layered and dynamic approach just like many other activities. Most people see the layered and forget the dynamic. Too many folks think they can put on the first layer and it will protect them from everything. The other end is that people will become so trusting in their first few layers that they become complacent. I would argue that a good "fort" will deter most of the average zombies. They will move to easier pickings. At a point that will stop and some zombies will test the defenses. If they find a gap they will exploit it. The trick is to be flexible and be prepared to move if your options run out. Change your protections after the zombies probe it. Modify structures and terrain but do so with action in mind dont make changes as a reaction to the zombie movements. Just above all be prepared to move. Jeff Cooper referenced 1972's FM 5-15, Field Fortifications. That field manual has been superseded by 1985's FM 5-103, Survivability. You may also want to search online for information on HESCO Bastion Concertainer Barriers, a currently used system made available after the writing of FM 5-103 and FM 5-15. Remember that all temporary hidey-holes are just that - temporary. The fortresses of the Maginot Line were mostly bypassed or decidedly taken by the Germans, and the moat and sturdy brick construction of Confederate-held Ft. Pulaski outside Savannah, Georgia could not withstand U.S. rifled guns fired from Tybee Island. Disgusting. Free men talking about holding out in hidey holes waiting for Leviathan to come devour them one at a time. No talk whatever about standing shoulder to shoulder and taking the fight to the bastards that would enslave us all. No talk about about making them bleed and die on their ground. Parker and his men stood on the green. They didn't have a chance but they stood. We are so far separated from our heritage that it is not even funny. We are cowards. Cowards all. I am sickened by the current state of play. You have stood with we few. You know just how few that is. Making it easy for the Bad People to win does nothing constructive. Action in a thoughtful way that preserves resources makes sense. If you do decide to fight, and possibly die, you need to set up your area of operations in a way that allows you maximal chances of success. If you do a good IPB it doesn't guarantee success, but it definitely minimizes failure. Sorry. Please accept my apologies for venting. And CA, I appreciate your kind words. But the scenario we're talking about has a name. It's called a mopping up operation.